I’ve always enjoyed breaking rules, especially when it comes to circumventing some of the regulations around food. I try to buy most of my food directly from farmers that I know, either from our local farmers' market or from my visits to their farms. Lately, that has meant buying “organic” produce from sustainable farmers who use organic methods but choose not to be certified organic. I also buy pork that is not USDA-inspected because my farmer does not want to stress her pigs by trucking them four hours to a large USDA-inspected slaughterhouse. I think that government regulations and "certified organic" stickers are just a substitute for knowing how your food is farmed. I know my farmers, and I trust that their products are clean. Since I'm all about minimal processing and the farm-to-table connection, I was excited when one of my favorite local farmers showed up at the market with raw milk. I'm old enough to remember drinking raw milk on my great-grandmother’s farm. I still remember how rich and creamy that milk tasted compared to the pasteurized milk I was used to drinking. Raw milk sounded like the ultimate in farm-fresh goodness and, even though I knew there were risks, I started to drink it on occasion. I did my due diligence — visiting the farm on many occasions, watching the milking process, talking with the farmer about his methods. Well, actually on that last one, I guess I could have done a little more discussing. I never asked exactly what the process was to prepare the cows for milking, or who did the milking, or how they sterilized the containers. My farmer is a really nice guy, very sincere about making good-quality products, so I figured that he knew what he was doing. And for more than a year, I had no problems. Until I did. Last week I bought raw milk on Sunday, drank a glass on Sunday night, and by Tuesday morning, was starting to have some intestinal grumblings. By Wednesday, I was so sick I could barely get out of bed — fever, sweats, chills. And when I did get out of bed, it was inevitably to go to the bathroom. I was sick for five days. A test revealed a crew of campylobacter bacteria having a blowout party inside my body. There are two typical routes for campylobacter transmission to humans in North America: eating raw poultry, or drinking raw milk. My only source of exposure was raw milk, so even though I wasn’t able to have the milk tested for bacteria, I’m pretty sure that the raw milk made me sick. Given that I’ve been a bit of an anti-regulation food purchaser, maybe I was heading for a fall. Many times, I've thought, I've gotten what I deserve when I make food choices that defy common sense. When I am dumb enough to buy strawberries in December, I pay a premium price for hard, tasteless strawberries. When I ordered a lobster dinner last summer in northern Idaho, I got a rubbery, flavorless lobster tail and paid $45 for it. Usually, I already know that I'm making a foolish choice. But sometimes I want something out of the ordinary, so I take a gamble — and lose, almost every time. The raw milk was a gamble. Eventually, it caught up with me. After my experience with campylobacter, I understand why the process of milk pasteurization changed the dairy business. Pasteurizing milk (or other liquids) with heat destroys bacteria, viruses, and other pathogens that cause food-borne illnesses. Raw-milk drinkers believe that pasteurization destroys beneficial proteins and enzymes in milk that strengthen the immune system and help digestion. Many raw-milk drinkers claim that unpasteurized milk offers significant health benefits; fewer allergies, resistance to colds, and weight loss are common benefits cited. But when I drank raw milk, I never noticed any of those health benefits. The Centers for Disease Control (CDC) website calls raw milk "a continuing vehicle for the transmission of infectious disease agents in the United States." The Food and Drug Administration (FDA) website warns that "raw milk can harbor dangerous microorganisms that can pose serious health risks to you and your family." 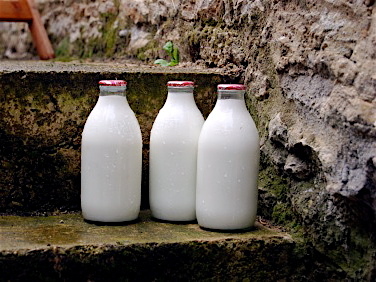 Given the well-documented risks of food poisoning from raw milk, I was shocked to read that some raw-milk aficionados even suggest giving raw milk to babies and young children. Even though you can find many websites passionately touting the safety of unpasteurized milk, the CDC has documented thousands of illnesses related to raw milk during the last decade. Many thousands more illnesses (like mine) go unreported. I have no problem with farmers selling raw milk to informed consumers, but I think that the risks of raw milk outweigh the benefits. As a person who likes to bend the rules, I can understand why consumers want to have the choice to buy raw milk. I just won’t be one of those consumers any more.